The Khmer king Yasovarman I was ready to rock. He had honored his father, King Indravarman I, with the Lolei temple. Now he aimed to create a stellar future nobody in Khmer society had reached for. 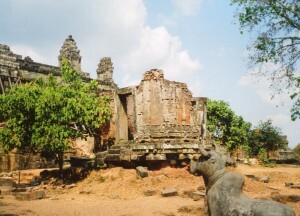 Yasovarman began by founding the city of Angkor. He did it in dramatic fashion. Yasovarman named his new capital after himself, Yasodharapura. His ancestors had named the old Khmer capital at Rolous after a god, Harihara (half Shiva and half Vishnu). Yasovarman struggled with his brother, the crown prince, for the throne, and vanquished him. This might have impelled him to build a new capital, and outdo the past. He built a heck of a spread. It was enclosed in an earth bank, and 4km square–larger than Angkor Thom, which was built over his city in the 13th century. Though Yasovarman tried to outshine the past’s grandeur, he kept its roots by building the three types of great projects his father did. Yasovarman already constructed an ancestral temple. Now he dug the biggest reservoir (baray) the Khmers had made so far. It extends more than 4 miles–longer than 20 ocean liners. He now worked on the third great construction project, the state temple for the royal cult. This monument, Phnom Bakheng, became the center piece of Yasovarman’s new city. 1. Yasovarman followed some of his fathers traditions, which he put into his royal temple, The Bakong. Phnom Bakheng also honors Shiva (the bull you see respectfully looking up at the temple is Shiva’s mount). It’s also modeled after Mount Meru, the mountain in the center of the Hindu and Buddhist universe, and it has 5 platforms that sit on top of each other. The above picture is from one of its terraces. 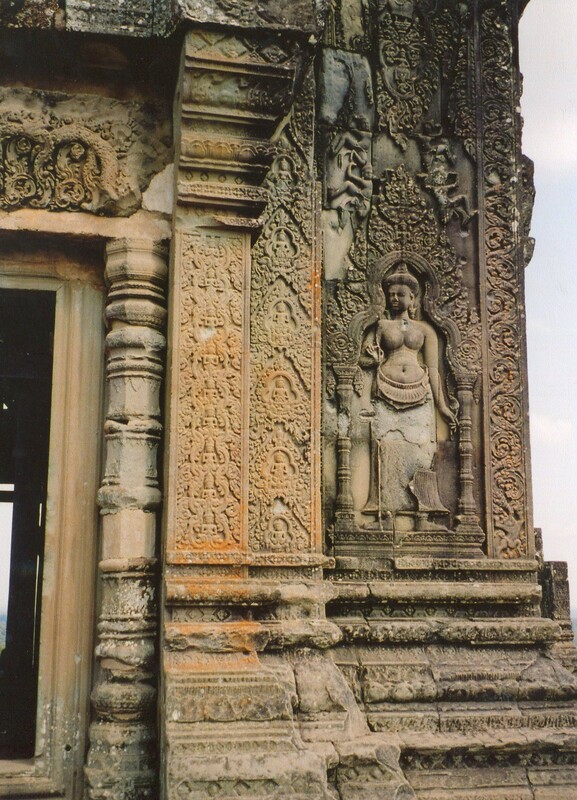 And the carvings on the shrine at Phnom Bakheng’s summit are worthy of the aristocratic elegance of Preah Ko. 2. But Phmon Bakheng’s grandeur exceeded the Bakong’s. Yasovarman built it by carving it from a 200 foot high hill. This lofty base enhances the feeling that the temple is the center of the universe. 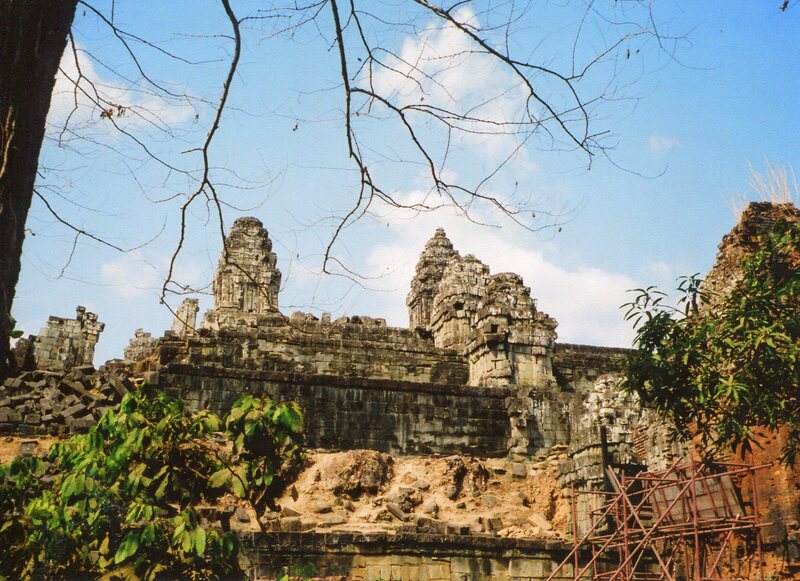 It’s just down the road from Angkor Wat, and when you climb it, you can look down on its pineapple-shaped towers. Survey the opposite direction and Tonle Sap spreads below. Its glimmering surface under the ebullient sun stands out from the forest and fields. Even a Pizza Hut would seem sacred up there. 3. 44 brick towers surround Phnom Bakheng’s base. 60 sandstone towers grace its terraces. 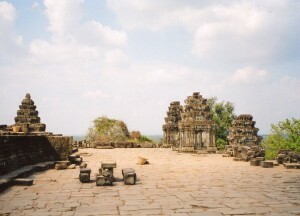 On the summit, 4 towers surround the central shrine, like the 4 mountains around Mount Meru. 44, 60, and 4 add up to 108, which is a sacred number in Hindu and Buddhist cosmology. So Phnom Bakheng was a model of the universe. 1. The combination of symmetry, grandiose proportions and elegant carvings into aesthetics that highlight the power and sacred refinement of elites. 2. The temple mountain as the center of the royal cult. 3. Numerical symbolism that correlated the royal temple with Hindu and Buddhist cosmology. 4. Associations of the royal cult with Shiva’s power. 5. The enormous reservoir, and thus connections between the king and the annual monsoon and flooding of Tonle Sap. Yasovarman made these more dramatic, and solidified them as basic Khmer thought patterns for much of Angkor’s history. Their dramatics served as models of order in the growing empire that was based on rice farming and the regularity of its seasons. We are a gaggle of volunteers and opening a new scheme in our community. Your website provided us with helpful information to work on. You’ve done a formidable process and our whole neighborhood will be grateful to you. Best of luck to you. Khmer culture is well worth the effort!